The final version of IE 7.0 will be available anytime this month on Microsoft IE Website. 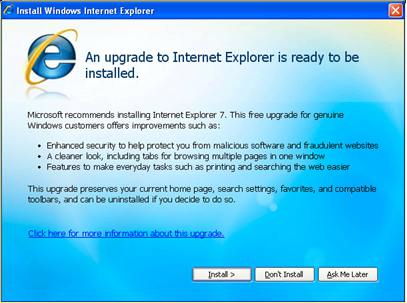 Like other Microsoft Security Updates and Patches, Internet Explorer 7 will also be distributed via Automatic Updates for Windows XP SP2 and Windows Server 2003 SP1 users. As some extra cautious users may want to delay installing IE7 on their Windows machines, Microsoft has provided a very simple registry key to block automatic delivery of Internet Explorer 7 on your computer. Without going into the technical details, just download and install the following registry file. However, you can alway manually install IE 7 from the Windows Update website or stand-alone IE7 installers which are sure to appear in the next issues of PCWorld and PCMagazine. Update: As you would notice in the screenshot above, Internet Explorer 7 will not install automatically – the Automatic Updates delivery process will include a welcome screen that offers users choices of Install, Don’t Install, and Ask Me Later prior to installation.